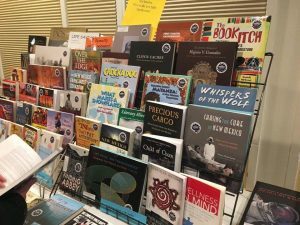 After being out of state for 5 straight weeks, I rushed from El Paso, Texas to Albuquerque, NM with thoughts of attending the New Mexico Arizona Book Awards Banquet. It started at 5:30 – I left El Paso at 12:30. What is normally a 3 1/2 hour drive for me, turned into traffic jams in two cities. My car was packed with enough stuff to outfit a gypsy caravan and I still have to change clothes when I got home at 4:30. LOL I unpacked the car in record time and made a quick change of clothes – neglecting any make-up and a necklace – but, hey! I combed my hair! After this I dashed over to pick up my friend Suzy, who was going with me for moral support. She was expecting me at 5:00, I pulled into the parking lot of her lab at 5:30. And wonder or wonders, my car was dinging at me that I had no gas left. [To be fair, it wasn’t quite full when I left El Paso.] So we stopped to fill up. We arrived a little after 6:00 to a crowded room, but found a table near the front with two seats together. The rest of the attendees had already been through the auction and the salad course by then. But all of this was worth it! 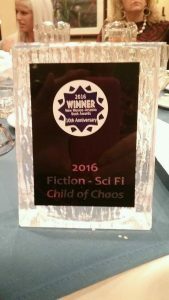 My book, Child of Chaos, won the Award for Best Sci-Fi/Fantasy novel. There were two winners in that category, but when they announced the name of the book, my mind went completely blank. As a matter of fact, I have very little recollection of the rest of the announcements at all. 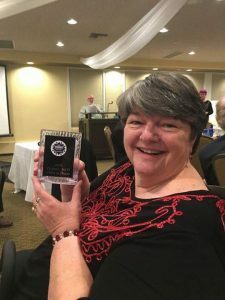 But here’s the award! 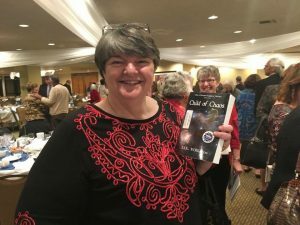 And Suzy was kind enough to snap pics of me with the award and a judged copy of the book with the winner’s label on it. However, she did neglect to tell me to take my glasses off my head. [Think I’ll forgive her for that one!] Thanks, Suzy!